February 07, 2013 in "colourway"
Chris and I have been working on new colours recently. We hope to have them ready to launch next week. They are some of my new all time favourites and I am crazy excited about them! It is probably totally irrational for someone to get this excited about colour, but this is me, the type of person who gets light headed looking at the perfect skein of green/blue/grey, take it or leave it. It is completely unfair of me to post the above photo. It's of some experiments that we recently did on silk and is not really representative of the new colours I'm talking about. 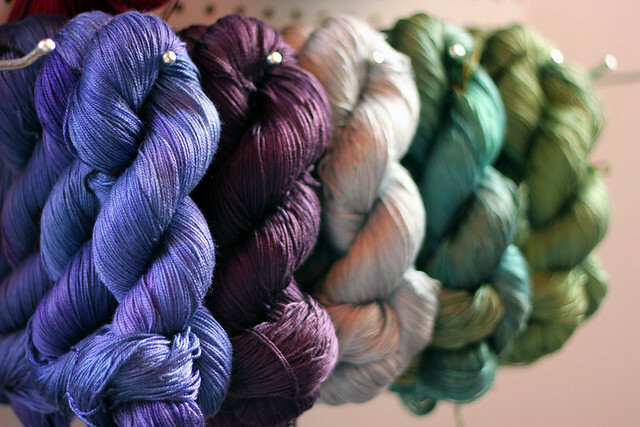 The photo was so pretty though, and the silk so shiny, that I just had to share!